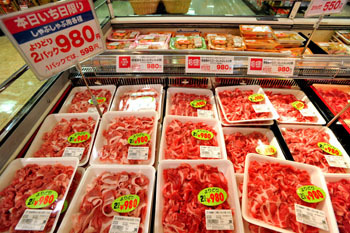 The most popular type of meat by far in Japan is pork. Nearly as much pork is consumed as chicken and beef combined. It is particularly popular in Okinawa, Kyushu, and the Kanto area. My mother was born in Saitama Prefecture in the 1940s, and she doesn’t remember eating beef except as a very special treat while she was growing up; she didn’t eat even the humble gyūdon (beef on rice) on a regular basis until she moved to Tokyo as an adult. Pork was the meat that appeared regularly on the dinner table. 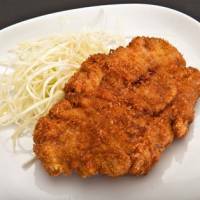 If there is one dish that managed to spread the popularity of pork more than any other, it’s tonkatsu — a breaded and deep-fried pork cutlet or filet, akin to European dishes such as the schnitzel. The name itself combines the Japanese word for pig — ton — with a shortened version of the English word “cutlet” (via the Japanese pronunciation). 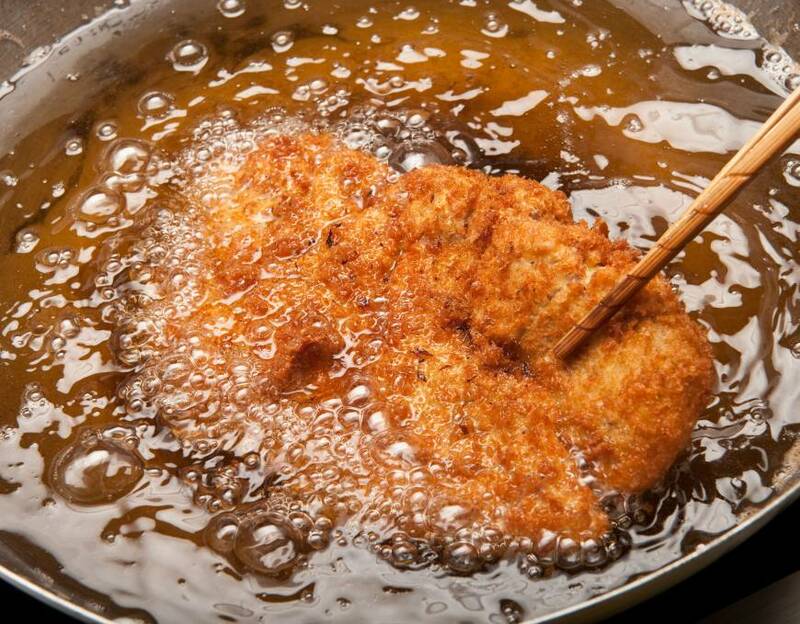 While katsuretsu, breaded cutlets fried in butter, appeared in an 1895 cookbook, the cooking method was soon changed to involve deep-frying in vegetable oil, which was considered more efficient and economical and better suited to Japanese tastes. Unlike curry rice and other yōshoku or Western-influenced Japanese dishes that evolved during the late 19th to mid 20th century, tonkatsu was embraced by more traditionally Japanese eateries such as soba restaurants, which were losing business to newfangled European-style restaurants. They saw tonkatsu as something they could make cheaply and easily that was substantial and filling. Several dedicated tonkatsu restaurants cropped up around the 1920s to ’40s, with even more opening in the ’50s and ’60s, after World War II — the big boom period for tonkatsu. Several still thrive, such as Ginza Bairin (established in 1927, and now with branches in Hong Kong, Singapore and Hawaii) and Maisen in Aoyama (founded in 1965 by one woman, and now one of the largest sellers of ready-made tonkatsu products nationwide). During the Great Depression of the 1930s, a piece of tonkatsu, which could be bought freshly cooked from the butcher, became the ultimate affordable payday treat for the poor working class. The position of tonkatsu as everyman food was firmly established. A basic tonkatsu is served whole or sliced for easy eating with chopsticks, usually with a mound of finely shredded raw cabbage. The thick brown sauce (known simply as “sauce”) that usually accompanies tonkatsu today evolved from the British Worcestershire sauce, and is made in a similar way by blending various fruit and vegetables with salt, vinegar and spices and then letting it age. Some people prefer to just squeeze lemon juice over the tonkatsu instead. Tonkatsu is so popular that you can enjoy it in various forms, such as: katsudon, sliced tonkatsu with onion and scrambled egg served over rice in a deep bowl; katsu karē, curry over rice and tonkatsu; katsu sando, tonkatsu sandwiches; kushikatsu, bite-sized tonkatsu on a skewer; tonkatsu ramen, a bowl of ramen noodles with tonkatsu; and even oddities such as chocolate-stuffed tonkatsu and tonkatsu parfait. 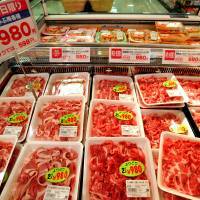 Let’s take a look at the history of pork in Japan. Prior to the introduction of Buddhism, the Japanese people hunted or farmed all kinds of animals for eating. Wild boars were domesticated and used both as working animals on the farm as well as for consumption during the prehistoric Yayoi Period. But with the establishing of Buddhism as the official state religion during the Nara Period (710-784), attitudes toward the consumption of meat changed from the top down. The Imperial court found both the killing and the eating of meat distasteful, and various official edicts were issued by Emperor Temmu regarding the way animals could be hunted and slaughtered. Curiously enough, hunting wild animals was considered to be more acceptable than domesticating animals for the purpose of consuming them later. So while people continued to hunt for meat, the domesticated pig gradually disappeared. The popularity of meat waxed and waned over the years, depending on who had control of the government at the time. When the bushi (samurai) class came into full power during the Kamakura Period (1185-1333), for example, the warriors who had conquered the country with much shedding of human blood decided that the shedding of animal blood was beneath them, and a wholesale ban was placed on meat. The eating of four-legged creatures such as pigs was considered to be the most offensive, two-legged beasts such as fowl a bit less so, and creatures with no legs — namely fish — were barely acceptable. This attitude prevailed right up until the Meiji Restoration of 1868. That’s not to say that pork was shunned by all. During the Sengoku or Warring States Period of the 15th and 16th centuries, the warlord leaders of Satsuma (present-day Kagoshima Prefecture in southern Kyushu) saw pigs as a valuable source of sustenance. Calling them “walking vegetables,” they ordered for a herd of pigs to accompany troops on their campaigns as living rations to be eaten along the way. The Satsuma warriors developed a fearful reputation as fighters, and their pig rations were credited for their superhuman strength and stamina. And in Ryukyu (present-day Okinawa), pork was eaten enthusiastically, especially after a visit in 1713 by Chinese officials who demanded so much pork (5,000 pigs in 250 days) that the Ryukyu court was forced to import some from Kyushu. During the mostly peaceful Edo Period (1603-1868), the well-to-do were still able to eat pork under the guise of health reasons. Meat was believed to make you strong and give you stamina, and pork was sold as a medicine by several Edo area merchants. The very last Tokugawa shogun, Yoshinobu, was so fond of pork that he got the nickname “Tonichi-sama” (Master No. 1 Pig), though it was probably never said to his face. During the Meiji Period (1868-1912), the consumption of meat was actively encouraged by the central government — a total about-face from what had preceded it for hundreds of years. The new leaders, looking to the West and seeing how their diet was centered on meat, considered that the Japanese people too should eat a lot of meat and dairy products, to become strong and tall like the Europeans and Americans. To eat meat was a patriotic duty. 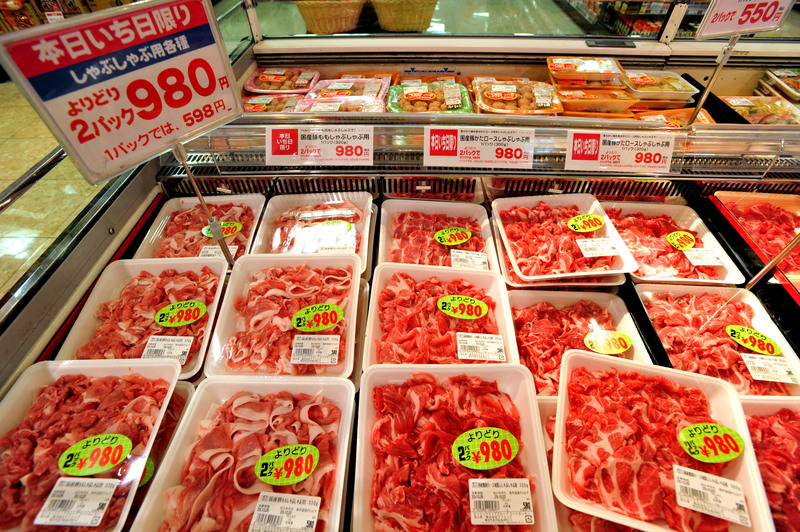 Pork was a lot cheaper to produce than beef, so its consumption increased rapidly. After the 1923 Great Kanto Earthquake devastated much of Tokyo and the surrounding area, some people even started to keep their own pigs as an emergency food source. But don’t try this at home! Makiko Itoh is the author of “The Just Bento Cookbook” (Kodansha International). She writes about bentō lunches at www.justbento.com and about Japanese cooking and more at www.justhungry.com. If you don’t want to eat out, most Japanese butchers sell tonkatsu and other breaded and deep-fried goodies, and there are still some dedicated “fried foods” stores too. It’s easy to home-made buy your tonkatsu and take it home, but tonkatsu made at home is still the best, since you can have it piping hot, fresh out of the frying oil. 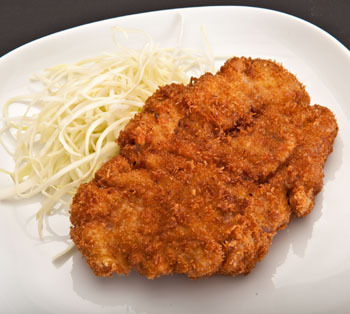 For great tonkatsu, get the best-quality pork you can afford, such as Kagoshima kurobuta (black pig). In Japan you can buy a cut that is labeled “for tonkatsu”; elsewhere, choose a pork cutlet and cut away the bone and as much of the fat as you desire. The meat should be about 1 cm thick. 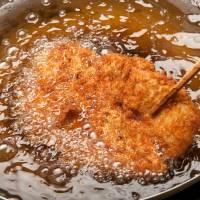 Use fresh frying oil with a high flash point such as peanut or canola. While you can use fresh soft breadcrumbs for the coating, it’s easier to achieve the distinctive crispy coating if you use panko (flaky dried breadcrumbs). Make small cuts all around the edges of the meat. If you are leaving a band of fat on one edge of the cutlet, make cuts in the meat where the fat meets it. Make small cuts into the meat overall, or use a meat tenderizer and bash lightly. This makes the meat less likely to curl and shrink up during cooking. Lightly season the meat with salt and pepper. Prepare three containers: one with flour, one with the beaten egg and one with panko. Coat the meat in the flour first, patting off the excess. Dip in the beaten egg next, making sure it is well coated. Coat in the breadcrumbs, pressing them all over the surface of the meat to ensure they adhere well. Heat enough oil to completely immerse the cutlet to 180 degrees C — this is very hot, so be careful. Put the cutlets in the oil one at time for 30 seconds, just to seal the surface and give it color. Take the cutlets out, and let the oil cool down to 170 degrees C. Skim off any breadcrumbs from the oil and fry the cutlets one at a time for about 2 to 3 minutes until cooked through. Drain and serve immediately with a mound of raw shredded cabbage, a lemon wedge and tonkatsu sauce. You may want to slice the meat before serving if the diners will be using chopsticks.